If you want to enjoy flying your own quadcopter but aren’t ready to shell out hundreds of dollars, check out this ultra-stealth nano drone. It’s designed for fun and easy stunt flying, but is small enough that you don’t need to register with the FAA. Right now, Jalopnik readers can grab one for 50% off -just $20, with free shipping. 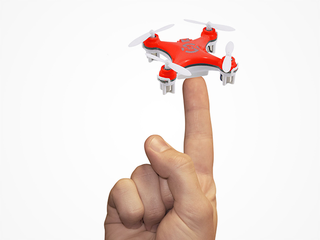 This tiny quadcopter makes for a fun and easy flying experience for any level pilot. With 6-axis gyro technology, you can effortlessly perform flips and navigate tight areas. Plus, it comes with 8 frequency points so it won’t disturb or crash into its fellow aerial vehicles when flying in a pack. And the best part? It’s small enough (1.02 oz) that you don’t need to register with the FAA. Interested? Head to the link below and grab yours for 50% off - just $20 with free shipping.